IMCDb.org: 1940 Daimler-Benz Pz.BefWg.III Ausf.E in "Great Tank Battles of World War II, 2001"
Panzer III, but I don't know what mark and the gun looks a little odd. 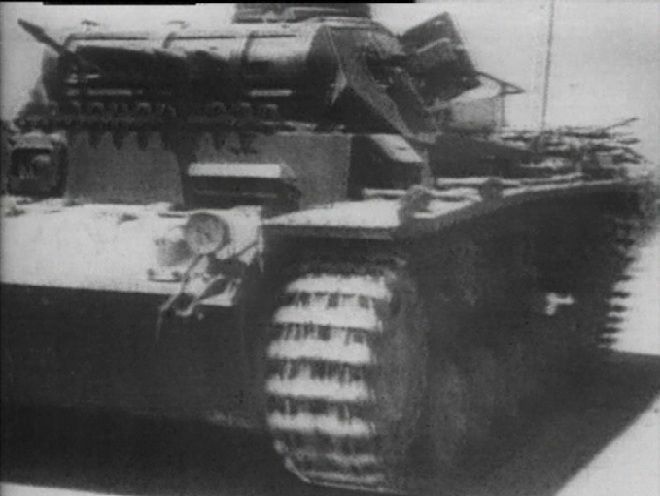 Panzer III Ausf E, fitted as a command tank..note aerial on rear deck........the main gun is a dummy because it will have 4 radios fitted, the other gun in the turret next to what would have been the main cannon, is an MG34. 1940 Daimler-Benz Pz.BefWg. III ("Ausf.E" as Extra Info). 2491tj is right, this is a very rare vehicle.